← Want an early Christmas present? 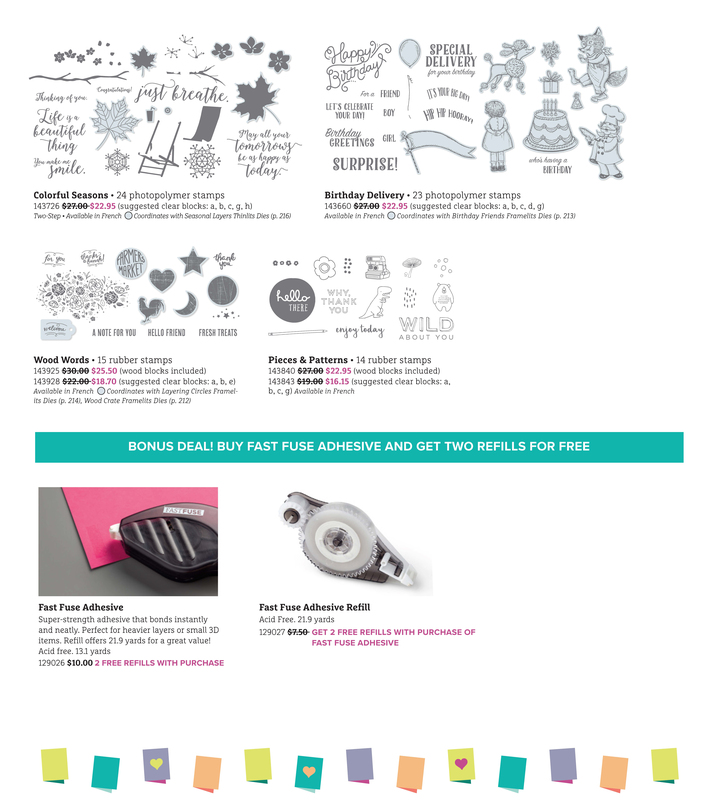 Earn this free stamp set! Saturday was World Card Making Day and I spent the weekend catching up on my card crafting. It felt good to be back in my craft room after so much time away. I decided to start with the new Painted Harvest stamp set and coordinating Painted Autumn designer series paper. 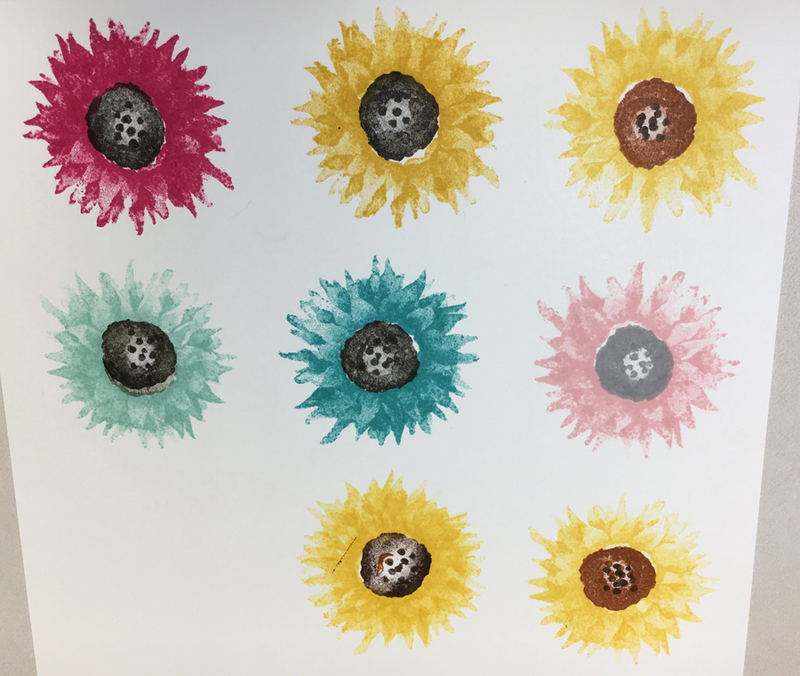 I’ve seen lots of fall cards made with this the 2-step flower stamp set so I decided to try some of my own. I pulled out my Daffodil Delight, Crushed Curry, Pumpkin Pie and Cajun Craze fall ink colors to see what the combinations would look like. I started with a sheet of Whisper White cardstock and just started stamping. Once I created those, I decided to branch out to non-fall colors and included Bermuda Bay, Pool Party, and Soft Sky. Of course I had to try my favorite, Melon Mambo, and then tried a softer Powder Pink version. I wanted to show the versatility of Painted Harvest stamp set and the Painted Autumn DSP for year round card making! Here’s my original set of flowers. Not what I expected and the details didn’t seem to showing up like others I had seen on various blogs. Still, I decided to create a set of 4″ x4″ note cards that I could give as a gift set. This first one was with Daffodil Delight and Crushed Curry on top and Early Espresso for the flower center and the greeting. I die cut the Daffodil Delight square with the largest Stitched Shapes square. I embossed the Whisper White with the Petal Burst embossing folder and used the “back” side. I cut a strip of Painted Autumn DSP (see buy 3, get 1 free offer below) layered over Early Espresso and tied at piece of linen thread around it to finish it off. The second flower I just used Daffodil Delight for both stamps to get this lighter flower. 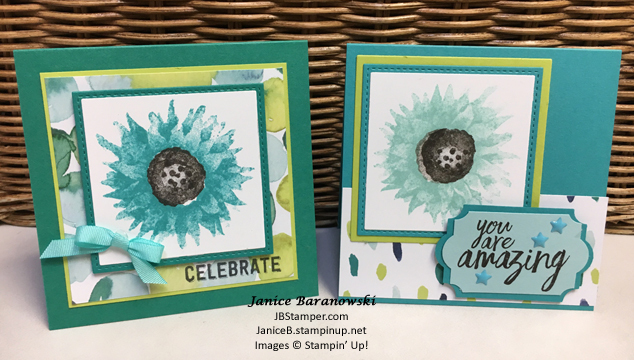 I stamped the flower center in Crazy Cajun and Chocolate Chip for the “dots” and the sentiment. I also used Crazy Cajun for the card base and layered on another of the Painted Autumn DSP prints. This time I tied a triple linen thread bow (so, so easy using Megan Saves “I Teach Stamping” 10-second bow maker! I’ve had mine for 4 years now! You really need this to make your bows so fast!). 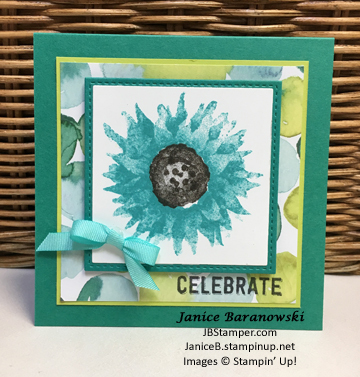 I then pulled out my Naturally Eclectic DSP (also on the buy3-get 1 free offer) to show you that the Painted Harvest stamp set isn’t just for fall cards! The first flower I stamped using Bermuda Bay and Pool Party and Early Espresso for the flower center and sentiment. I used a Bermuda Bay card base and Stitched Shaped square. I layered that over the new Lemon Lime Twist to match the DSP strip. The sentiments comes from the Painted Harvest stamps, stamped on Pool Party layered over the Bermuda Bay. I punched the tag out with the new Everyday Label punch. How did I get the layering effect? I punch the sentiment tag close the left side of the saying then reinserted it into the put from the top to prepunch the other side closer to the right hand side of the saying. Hence, a shorter width. Then I trimmed the top and bottom off so that the Bermuda Bay tag was visible underneath. I added stars from the Enamel Shapes. The second one was stamped with just Bermuda Bay ink. And I love, love, love these water “bubbles” from the Naturally Eclectic DSP on the Bermuda Bay and Lemon Lime Twist papers. I added a small bow (another 10-seond bow wizard!) from retired Pool Party ribbon. And you can use the Everyday Label Punch with the Labels to Love stamp set (I used the Celebrate sentiment from here). Such a fun, cheery card and definitely not a Fall card! Here’s the two “blue” non-fall themed Painted Harvest cards side-by-side. Doesn’t even remotely look like fall cards! Next up, one I CASEd from a card that Shannon Jarmillo created on her ShannonKayPaperie.com blog. I loved the Powder Pink and Smoky Slate color combination. I used Basic Gray for the card base and layered on a piece of retired Smoky Slate DSP. Again, I used the Celebrate stamp, but this time with the entire sentiment. I stamped the dots in Powder Pink and added some bling. This could be used for a anniversary card, birthday card, or other celebration event. For the last of my 4″ x 4″ cards I had to make one with a Melon Mambo flower…you know I have to get Melon Mambo into my cards somehow! This was color combination was CASEd from one by Mary Fish at StampinPretty.com. I used the Petal Burst embossing folder for the Whisper White layer, but this time with the “right” side up. I added another small bow in one of my retired ribbons. After finishing this set, I wasn’t happy with the way my flowers were stamping, so off to YouTube to see if anyone had a video with tips on how to stamp the flowers. Come back tomorrow to see what I found out and see my next set of Painted Harvest cards! And the DSPs I used on on special, buy 3 get 1 free through October 31! 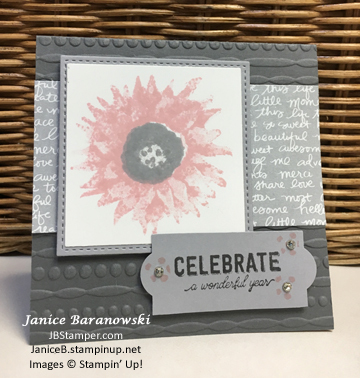 This entry was posted in Annual Catalog, Celebrations, Fall cards, Holiday Catalog, JB Stamper, Punches, Stampin' Up!, Stampin' Up! designer papers, World Card Making day and tagged celebration, Fall, fall colors, JBStamper, Stampin' Up!, Stampin' Up! Bundles, Stampin' Up! In-Colors. Bookmark the permalink. I really debated about getting this stamp set, but I saw so many cards made with it that I decided to jump in. So glad I did. Thanks Tina!